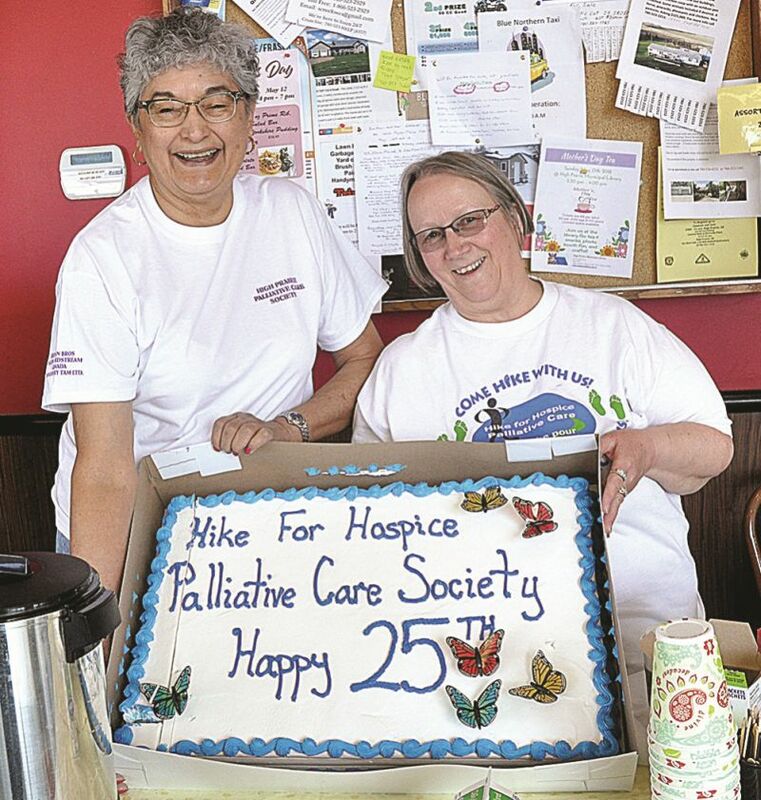 Palliative Care celebrated its 25th anniversary at last year’s hospice walk. Showing the cake are secretary Lillian Shirt, left, and society co-ordinator Debra Isert. It’s the High Prairie and District Holistic Palliative Care Society’s biggest fundraiser each year and worthy of community support. And it has a new name. The Violet Chalifoux Memorial Walk for Hospice occurs May 5 at Freson Bros. at noon. Formerly called Hike for Hospice, the society asks volunteers from High Prairie and area to complete a short hike after canvassing for pledges around the community. Every cent raised is spent locally by the society. Society co-ordinator Debra Isert says the hike has three main goals: fundraising, awareness and recognition. The annual hike helps recognize the valuable work done by society volunteers, health care providers, and the communities across the country. “Hospice palliative care is about dignity, quality of life, comfort and courage,” says Isert. “By sharing the care, we can help provide the quality of care and compassion that everyone deserves at the end of life. Pledge sheets can be picked up at the High Prairie Health Complex volunteer resource office or the admitting desk. The walk occurs from noon to 4 p.m.
Hotdogs and refreshments will be sold on location. The Rubber Band will provide live entertainment. Last year, $9,158 was collected one week after the hike with more donations still arriving. Meanwhile, Violet Chalifoux raised the most money: $1,750.